Nierman Preschool is what our parents affectionately refer to as "Our Happy Place" for the joyous learning and lasting friendships that are part of the incomparable experience. Nierman Preschool develops the social, emotional, physical, and intellectual well-being of each child through our developmental milestone curriculum. We have created a safe, nurturing environment that offers opportunities for exploration and discovery, and are committed to providing access to programs for children with disabilities. Refer to school calendar for holidays and vacations. Daily lunches and delicious challah for Shabbat can be ordered through the Preschool Office. The beautiful Glickman-Galinson Early Childhood Education Complex houses sixteen state-of-the-art classrooms, specially-designed bathrooms, a central outdoor playground, a special toddler/two year old play yard, an outdoor amphitheater, a kitchen, computer lab, and a multi-purpose room. Classes also utilize the Astor Judaica Library, David and Dorothea Garfield Theater, and Jacobs Family Gymnasium. All parents are required to participate in an earthquake preparedness program. A survival kit must be ordered if your child is new at the preschool. Please include the fee for earthquake preparedness with application fee. Help send a child to preschool by becoming a Sigrid & Jack Fischer Scholarship Patron! Many children need financial support to gain the growth and enrichment of a preschool experience. Learning activities are designed to match the developmental stages of each child, while attention is focused on the process and pleasure of discovery in each project, not on the final product. We strive to develop curiosity, imagination, self-esteem, caring for others, and the ability to play both cooperatively and independently. All children are provided education in music, physical education, and Spanish. Computers are available to students in 4+ year old classes. Teachers and specialists offer an integrated approach to education, combining learning and play, skillfully building on what children can already do, and challenging them to try new things. The environmental components in the classroom are enhanced by the "ta'am" (flavor) of Judaism, the heritage and values, which allows the children to cultivate a positive sense of identity for themselves and with the greater community. Jewish culture, traditions, holidays, and heritage are studied and celebrated with songs, stories, dance, cooking, and crafts. Shabbat is celebrated at school each week in an atmosphere of joyful togetherness and sharing, and cultural diversity is promoted and respected as children and families share their traditions from around the globe. Kid Konnection offers flexible extended day care. Parents can feel confident leaving their children for an extended day routinely or on an as-needed basis. Full-time preschool staff oversee the children's nap/quiet time and play. Time cards are maintained based on usage and are charged by the half hour. Monday – Thursday from 7:30 – 9:00 a.m. and 1:00 – 5:30 p.m.
Friday from 7:30 – 9:00 a.m. and 1:00 – 5:00 p.m.
TOTelahs offers one of the best toddler programs available in San Diego County. Parents and toddlers will love the individualized attention provided by an extraordinary staff who promotes social, emotional, physical, and intellectual development through nurturing supervision. TOTalehs come in as toddlers and grow into confident, creative, curious, and imaginative two-year olds. Our five-day program is designed to support working parents. Limited two and three-day options are available. Wednesdays from 11:30 a.m. – 1:00 p.m. Babies share engaging developmental experiences with their parents who also gain a support group of new friends. Music and movement, sensory experiences, Shabbat, and outdoor playtime round out this interactive program. Wednesdays and/or Fridays from 9:00 – 11:00 a.m. Enjoy this precious preschool adventure with your toddler while connecting with other parents and sharing family experiences. Participate in music, art, rhythm and movement, outdoor play, gym, Shabbat, and holiday celebrations. The Explorers class is uniquely designed for our oldest children who are given the gift of an extra year of preschool. The spiraled curriculum is geared to promote skill development and social independence which will enhance kindergarten readiness. This class, together with special programs and enrichments, offers an unparalleled experience, unmatched by public transitional kindergartens. Parent Participation Class is designed to be a transitional program for two-year-olds. Although parents generally phase out by the end of January, they are welcome to leave earlier or remain throughout the school year, depending on their family needs. This four hour class allows children to participate in extended day programs. We are fortunate to have a social worker and occupational therapist on staff to help identify children's needs and to assist parents and teachers with appropriate resources to maximize their children's potential. Unique social skills and motor skills enrichments are offered by trained specialists. Sports, music, creative movement, yoga, Karate, cooking, dance, science, math, and drama are among the outstanding enrichment classes offered each afternoon on a rotating schedule for 3–5 year olds. Classes meet once a week for approximately six week sessions. Further information about enrichment class programs is available through the Preschool Office. Enrichment Hours: Monday - Friday from 1:15 – 2:15 p.m.
Cutting-edge research in brain development emphasizes the benefits of learning a foreign language at a very early age. Through TLC, Nierman Preschoolers are offered a unique opportunity to build pathways needed to acquire a new language while also enhancing cognitive and creative abilities. Learning a second language is a 21st century skill which will prepare our students to live and work in a global society. Starting foreign language instruction early sets the stage for students to develop advanced proficiency in one or more languages. In addition, younger learners have the capacity to develop near native-like pronunciation and intonation in a new language. These classes are wonderful opportunities for children to have intensive language exposure while participating in traditional classroom studies during the school day. Registration for the 2017 – 2018 academic school year opens January 2017. Families currently enrolled at Nierman Preschool have first priority. Spaces are limited in some classes. In order to get your first choice program, please sign-up as soon as possible. To apply, please register with the application fee. The application fee will only be processed upon guarantee of a space. A waiting list will be maintained for children who are not enrolled due to lack of space. Members of the Jewish Community Center have priority placement. Non-members are welcome to become members and to have their applications processed immediately. Membership priority placement will be contingent upon members' accounts being current for all fees and dues. Ignite the Night is a social evening out for Nierman parents and their friends, an opportunity to create community and connection, while at the same time raising funds for a specific purpose in the preschool. This year, proceeds will benefit our preschool's outdoor nature, sensory and STEM enhancements. 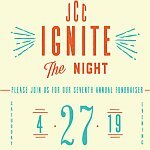 Would you like to help underwrite Ignite the Night?